Who are you calling dull and brown? Why is it that we don't always fully appreciate the birds that regularly visit our gardens? We seem to be always on the look out for a new visitor and write off lots of our garden birds as just boring little brown birds. Many people may even think that all little brown birds are the same species. Well look again! When the sun is on their backs our little brown birds are not in the least bit boring. I took this photo of a male house sparrow on one of our feeders. Before you ask - he didn't turn around at the last minute - I wanted a photo of his back. The colours and patterns on his feathers were anything but boring! Sparrows live in flocks which is maybe why they are overlooked as people may just see the flock and not the individual birds. If you look closely a an individual though you may spot subtle differences for instance the size of the male sparrow's dark bib varies. The larger the bib the more dominant the bird is - so basically the head of the flock has the largest bib. At the start of this post I asked why we overlooked birds that regularly visit our gardens. Although we have house sparrows in our garden I know that in many places house sparrows have disappeared. They are now on the RSPB red list which means their numbers have fallen drastically. For a while we didn't see many sparrows in our garden but thankfully this situation has improved. Maybe this is one reason that we now appreciate them more! The competition to win the Vegetable Seeds book by Terry Woodger closes at the end of this week 31 March so if you haven't already entered make sure you get your entry in by the deadline. If you missed the post about the competition it is here. Watch our for the competition next month where the prize will be Terry's Herb Seeds book. The flowering shrubs are now adding to the colour and in some cases scents of our garden. You may remember I have mentioned in earlier posts that we have a daphne shrub that appeared in our garden from nowhere. It nearly was weeded when it was tint but but something stopped me. It didn't look like a weed and in such cases I like to wait and see what happens. Fortunately it has a very upright growth as the birds planted it on the very edge of a border tucked up against an arch. Too late to move it but in a way it means we can appreciate the scent. I'd like to think that it was the birds way of saying thank you for feeding us but I guess I'm over-thinking. It does show though how you can plant the berries from a plant and end up with something special. This other shrub was planted by us - it's a pieris - Forest Flame which was planted many years ago and is now quite a size. At the moment it is dripping with flowers. The clusters of bell like flowers remind me of bunches of grapes. 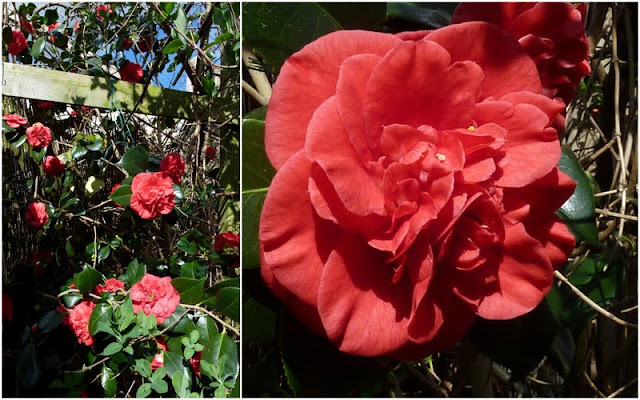 Then there's the camellias - the one that Martyn gave the hard chop to is flowering down the side that he didn't chop but most of the flowers are hiding at the back of the plant. Hopefully this will 'green -up' at the front but how long will that take? Then there is the one that really needs either moving of pruning. The magnolia buds are also gradually opening - a few sunny days and it will be spectacular. Having so many flowers we tend to focus on the whole picture rather than individual flowers so I decided to take a close-up photo or two out of a bedroom window. Individual buds are much pinkier than they look when fully open. The shrub is certainly going to be loaded with flower again. The alliums have moved home! I should say some of our alliums have moved home namely the ones that have been living in the relative comfort of the greenhouse. The garlic that was raised in pots has now been planted out on the plot. There isn't really a lot to choose between them at least not on the surface. This is maybe down to the fact that we haven't had a wet winter - the main reason that I start garlic in pots is to avoid them sitting in soggy soil. 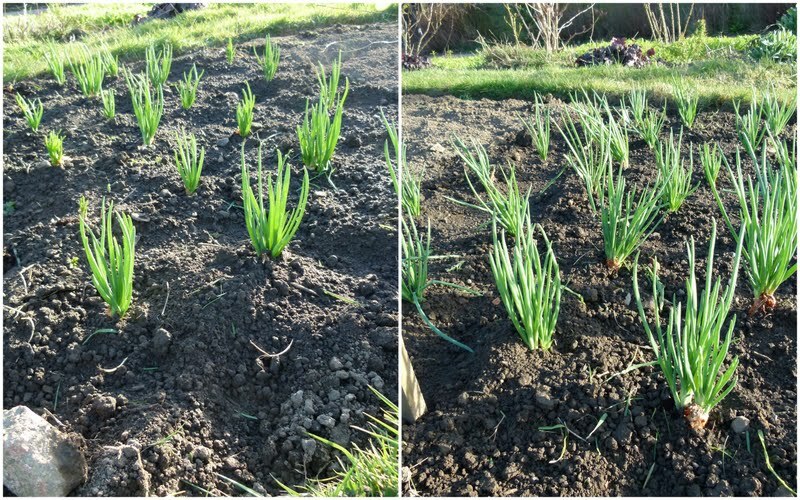 When it is very wet our clay soil some becomes waterlogged which isn't ideal for garlic. The cloves planted outside were slow to get going but now growth seems to have evened out. The pot grown garlic have developed good root systems - something that I can't check for the cloves planted straight in the ground. The elephant garlic started in pots is looking particularly strong. They are the ones at the front of the photo on the right. At the moment two varieties are rather disappointing. Chesnok Red and Messidrome, although performing slightly better in the pots, haven't really grown very well in either location. 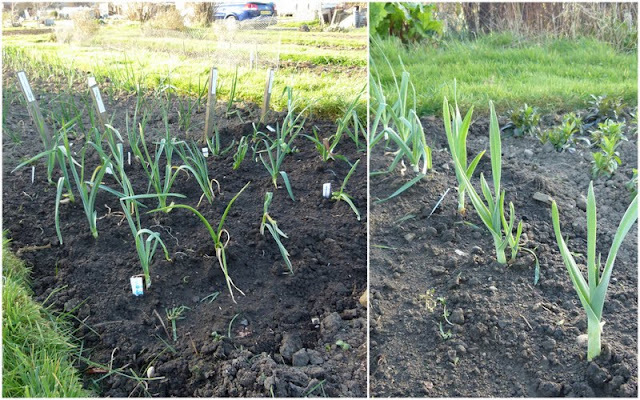 The garlic planted in the tubs have just been moved outside of the garden greenhouse. I've planted out the shallots - Picasso and Yellow Moon - which were started in pots. These have made lots of growth so I hope they don't resent the move too much. I've also planted out the onions that were also started off in pots in the greenhouse. These were Setton - yellow - and Snowball - white. We have three varieties of heat treated onion sets still to come. Heat treated sets are always available much later as they need time to undergo the treatment which kills the flower bud in the centre of the onion bulb. This means, if successful, (and it usually seems to be) the onion won't bolt as it has no flower bud to enable it to try to set seed. 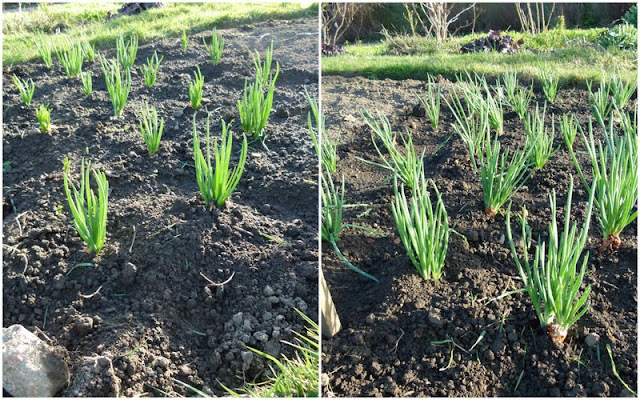 The onions aren't planted as far apart as this photo implies - they are just spaced at a trowel head's length. I found last year that was about right to enable me to be able to weed among them without digging pulling up the onions. It's about now that I start to think that we may have overdone the onions. As ever Martyn thinks it will be fine! As the ones grown last year rotted at an alarming rate in storage we decided to 'just make sure' we would buy extra sets. Having said all that we are still using our onions so last year's crop is managing to see us through. Onion soup anyone? Although the area defined as the Rhubarb Triangle is subject to various interpretations Wakefield is a constant so it is hardly surprising that we grow quite a lot of rhubarb on our plot. 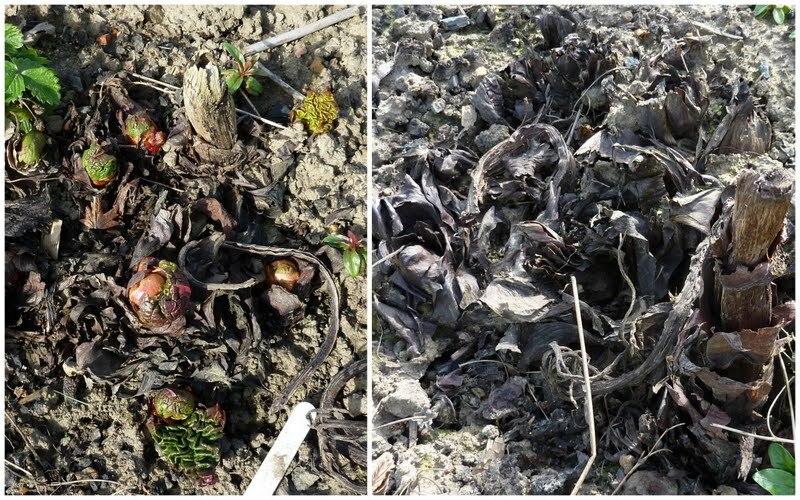 Reading up on how you should cultivate rhubarb you would think that on a heavy clay soil and given little attention that our rhubarb shouldn't flourish but it does. 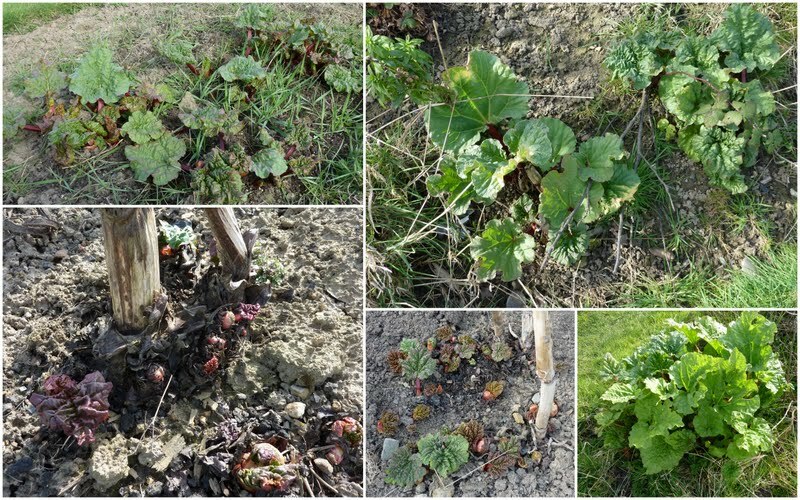 When we took on our plot, in the grass path along one edge, a clump of rhubarb persisted in growing in spite of numerous attempts to dig it up - in fact some of our clumps are descendants of this unknown variety having been hacked from the main clump as we tried to dissuade it from growing again and again. Eventually we won the battle but for a year or two the rhubarb gave us a good fight! I've noticed on different blogs people have been comparing how far into growth their rhubarb is but there are so many different varieties of rhubarb some are early into growth and others later so it's hardly surprising that some people will have rhubarb ready for picking earlier than others. Our earliest variety is Timperley Early - its a variety often used for forcing although we've never forced ours. Maybe it's a childhood thing (I can't remember a time when I didn't have fresh rhubarb to eat from a garden or use its leaves as a makeshift umbrella) but we quite like our rhubarb grown naturally. Soon we'll be harvesting sticks from Timperley Early. Then we have a couple of roots of Champagne rhubarb - this isn't as advanced as Timperley but is another fairly early variety. At the moment some leaf buds have just burst open. Another of our varieties is Giant Crimson Grooveless. Strangely taking into consideration its name this variety doesn't grow as large and has very red stems. No leaves on this one yet but plenty of bright red leaf buds. The last of our identifiable varieties is Raspberry - its strange how rhubarb steals the name of fruits as there is a variety called Strawberry and another called Early Cherry and another called Irish Apple. Maybe it's trying to make up for the fact that technically rhubarb isn't a fruit at all! One of the Raspberry rhubarb clumps is causing concern as it looks dead but the leaf buds of the other are just starting to burst. Then we have a few nameless clumps. At least one may be Victoria as I seem to remember us growing some of those from seed ages ago. 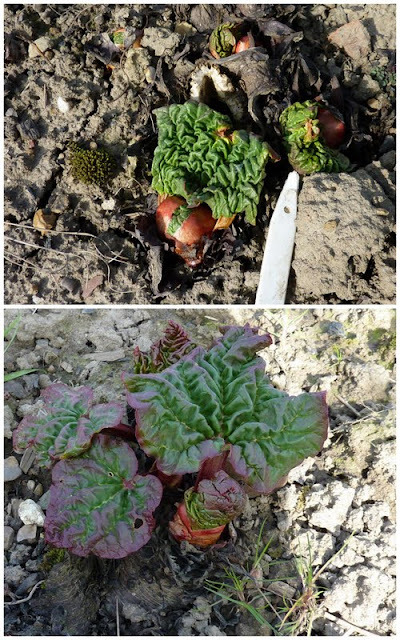 These are at different stages of growth and many are swaddled in weeds but it's quite difficult to remove weeds that decide to grow wedged in the clumps and the rhubarb doesn't seem to mind! At least three frogs are still there today - they are male as they are croaking! The spawn also seems to have so far escaped the fish. As I approached the spawn for a closer look, one large frog was sitting on it and then these two swam up, climbed on the the spawn and gave me a hard stare. They obviously see me as a threat maybe they remember that I stole some spawn earlier and don't realise that I did this to help! They are feisty little things to try and intimidate something so much bigger than they are. When the fish approach from the other direction they definitely seem to turn toward them for a face off! Has anyone else observed this type of guarding behaviour in our native common frog? I hope you've noticed the link above this post to the epetition calling for the government to review the fact that the Air Ambulance have to pay fuel duty even though it is totally funded by charity donations.. I've signed up! You may remember the excitement when what we thought was our nectarine tree had flower buds last year. Well after actually harvesting fresh peaches last year from what turned out to be a peach tree. This year the excitement and anticipation is even greater! What we now know to be our peach tree - Avalon Pride - has lots of flower buds. Excuse the hand but it's the only way I could get the camera to focus on the buds. Once the flowers open we will have a few anxious weeks hoping the frost doesn't put paid to any idea of fruit. last year we covered the flowers with fleece on a night to give some protection. I can just imagine the taste of the freshly picked peaches last year. This year if we are lucky to have more fruit at least we won't be waiting for the fruits to lose the fuzzy skin as we did when we thought it was a nectarine tree. So what about the nectarine - Fantasia - you may remember that it had an extended stay in the back of the delivery van which caused concern but it appears not to have suffered from this and being in the greenhouse at the moment it is ahead of the peach and already has some open flowers. Being in the greenhouse will have caused it to flower a little early. It may also mean that insects won't access the flowers so I am poised with a soft brush. Once the pollen seems to be running I'll give it my best imitation of a furry bee and hope that I am as successful a pollinator. The apricot - Flavourcot - isn't showing any signs of flower buds but there are some tiny green shoots now forming on the bare branches so at least we know that it is alive. 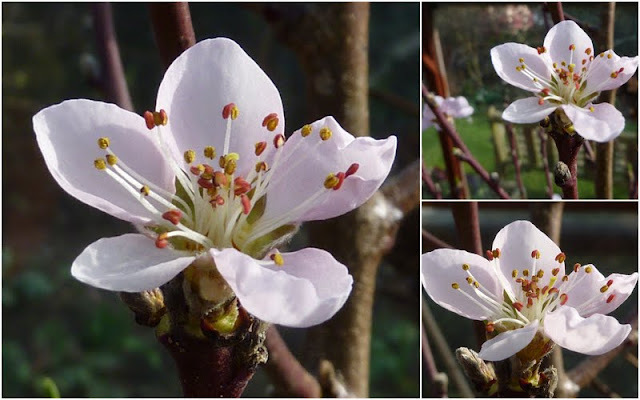 I'm not totally sure whether apricots flower before they develop leaves or whether they are as early as the other two. Then there is our kiwi - Issai - which looked to be struggling at the end of last year. It had plenty of fruits but they didn't grow bigger than a grape. This year it seems off to a good start and hopefully now it is planted in ericaceous compost it should enjoy life more. So here's hoping for a mini kiwi or two to enjoy with our peaches, nectarines and apricots. I hope that saying that doesn't push our luck as if so we will be two very disappointed fruit lovers. Fingers, toes and anything else that will crossed will be crossed for a while! Just a few photos taken on our weekend visit to the plot. We had all afternoon at the plot yesterday. Whilst Martyn was busy with his tiller I was busy weeding. This may be a strange thing to admit but I quite like weeding - somehow it's satisfying to look on a tidy weeded bed with loosened soil. I'm a girl of simple pleasures! Yesterday one of my weeding tasks (task makes it sound unpleasant doesn't it maybe I should say experiences was to weed around the row of native primroses that grow along the foot of the reluctant kiwis. 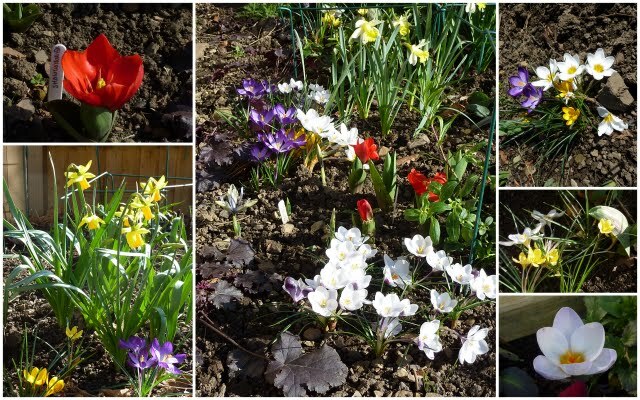 They are in full flower at the moment but were surrounded by weeds so I sat on the grass, with the sun warming my back, weeding around them taking care not to pull up any of the tiny self sown seedlings. A couple of ladybirds chose one of the flowers for a romantic liaison so I had to take care not to disturb them too. As I worked the delicate scent of primrose drifted in the air, furry bumble bees checked out the flowers and up in a tall tree just to the right of the photo a bird sang it's heart out. It satisfied four of my fives senses - I suppose I could have nibbled on a flower and then I would have had the full set but I chose not to go as far as that! We have a small patch of primroses in the garden in the bed where the snowdrops and hellebores are planted but, being more shaded, these are only just beginning to leaf and it will be a while before we have flowers there - that is if the birds don't take a fancy to the buds - strange how they leave the ones on the plot alone. They have really overdone the frog spawn now - take a peek at Martyn's post. Last week I posted that the frogs had returned to the garden pond. We still have one or two doing what frogs do at this time of year but there doesn't seem to be anything like the number that there usually is - maybe some more are on the way. Martyn posted that clumps of frog spawn had appeared in the pond. Well as expected the spawn in the photo shown in his post seems to have disappeared so we are assuming that the fish have had a feast. Not to be thwarted the frogs have deposited more spawn but as its chances of survival seems very limited yesterday I decided to try to rescue some and raise some froglets in the safety of an old fish bowl with some water taken from the pond. When I was teaching in primary school I did this several times successfully - in fact I think our current frogs are maybe descendants of some froglets that escaped from the greenhouse one half term when I brought them home to look after. I was only going to scoop a small amount from the pond but the clumps are so firmly fixed together that I ended up with far more that I intended. Once the tadpoles have wriggled free I'll have to release some as so many won't be able to live comfortably in the bowl. Hopefully we'll be able to chart the froggy development. It's that time now when sowing seeds is just a steady process that will continue for much of the year. Things will start off slowly - speed up and then steady off again. March usually marks the start of our seed sowing season although this year the celery and celeriac were sown in February in an attempt to finally succeed in growing a crop. The true leaves are beginning to develop so it's a case of so far so good but there's still plenty that can go very wrong! Most of our seeds are started off in the greenhouse in either trays, pots or modules to be transplanted later. This way works for us on two counts. Firstly our clay soil isn't ideal for seed sowing - any seeds that we sow direct such as carrots and parsnips are sown in a trench of compost which then needs to be kept well watered. Secondly sowing in pots in the garden greenhouse means that we can keep a closer eye on progress - if we grew vegetables close to hand in our garden it may be different! With the pace of seeds sowing due to take off - it's at this time that I look at our seed collection and think - have we overdone it this year? Will we have space in the greenhouse to sow and grow on all the seeds we have bought? Will we have have room on the plot for all the resulting plants, and potatoes, and onions, and shallots, and strawberries and ...? As usual our original seed order has been swollen by freebies from magazines, tempting visits to garden centres and being seduced by gardening programmes. We both watched Sarah Raven's series on Bees, Butterflies and Blooms (if you missed it you can view it from here) and started planning in our heads where we could have a patch of 'wild' flowers. The result more seeds added to our collection. Anyway I comfort myself by the fact that I always feel like this at this time of year whereas Martyn's philosophy is that we'll find somewhere! Let's hope he's right! Anyway I could post a list of the seeds sown in umpteen different posts but I don't want to frighten you off or make you curl up your toes in boredom so instead we have pages on our website accessed from the Sow, Grow & Harvest tab at the top of the blog. 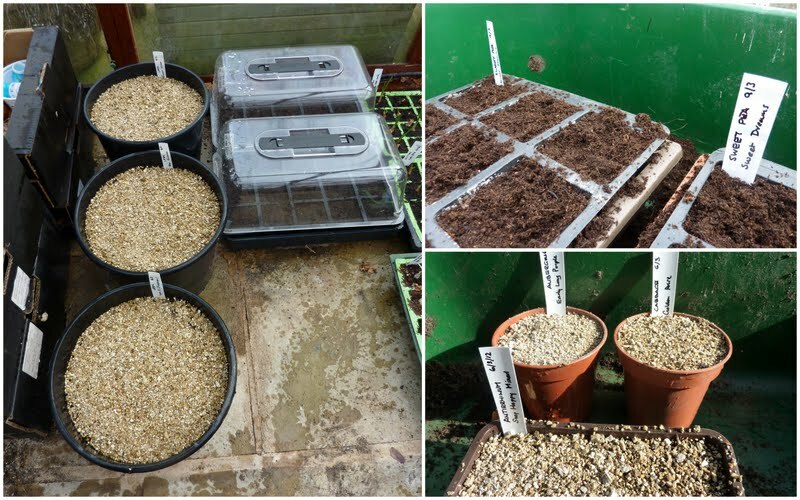 Our March vegetable sowings will be listed here and flowers will be listed here Other links on this post take you to pages on our website that go into more detail just in case you are interested. I also keep a diary of all our gardening activities month by month on our website which goes back to January 2007 and can be accessed from the Garden Diary tab at the top of the blog. This is a full account of what we are doing and when. If the competition submission form doesn't work try using Google Chrome - the form is a Google document and Google and Microsoft seem to have a policy of making sure their utilities don't work with the other company! On Word Verification you may not even realise that your blog is using the awful new word verification as when you reply to comments it doesn't appear. You may have been noticing that less people are making comments on your blog. Many people are avoiding commenting on blogs that use WV - if you moderate your comments then you don't really need to use WV as well as you can delete any machine generated comments before they reach your blog. WV doesn't stop people posting spam - just machines. You may also like to take a peek at the cards I have been busy designing here on my new website - if you take lots of photos you may even be interested in having a go yourself - I don't expect to sell many cards but it's fun creating them so I don't really care! Just thought I'd give a bit of a summary as to what is happening in our garden greenhouse. If you read Martyn's blog you may already know about some of our recent acquisitions so bear with me. You may remember our peach/nectarine mix up. Thompson and Morgan sent us a peach tree - Avalon Pride - instead of the nectarine - Fantasia that we ordered. We picked eight fresh peaches from it last year so weren't really complaining - who would - when we asked T&M if there had been a mistake or whether we had acquired a fuzzy nectarine. Anyway the result was a promise to shop out a nectarine this year. It's arrival caused a bit of concern as the delivery man said he had 'found' it in the back of his van where it had apparently been languishing for over a week. The arrival of the nectarine was closely followed by the arrival of an apricot tree - Flavourcot that we ordered last year. Both of these are destined to be grown in pots in the garden rather than risk the precious fruit on the plot. 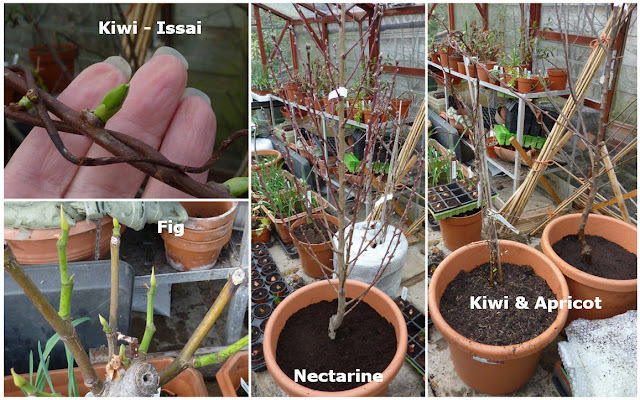 So each had been potted into a large pot both of which will stay in the greenhouse for a spell of convalescence after the trauma of transportation - thankfully the buds of the nectarine are showing signs of green which is an indication that it has survived its long stay in the back of a dark delivery van! You may also remember that last year we bought a miniature kiwi - Issai and that after a promising start it began to look a little unwell. We hadn't high hopes for it's survival but when we saw tint signs of life we (well Martyn really) discovered that it prefers an acid soil and so it has been repotted into an ericaceous compost and it is producing lots of healthy green shoots. Then there was our Lazarus fig (renamed by me as it rose from the dead!) Well that is actually shooting too. The new perennials I have mentioned before - they are already beginning to produce more shoots - but I also took some perennial cuttings last year and most are still alive. The salvia in the front flower bed that I was concerned wouldn't make it through winter looks doubtful and unfortunately the cuttings that I took from it that were growing so well look as though they haven't managed winter in the greenhouse either. On the plus side my lavender cuttings are starting to grow away. I also have several arum lilies which are beginning to shoot. I dug up and split a large clump that was growing in the garden last year and if all the pieces grow will have my work cut out finding space for them all. 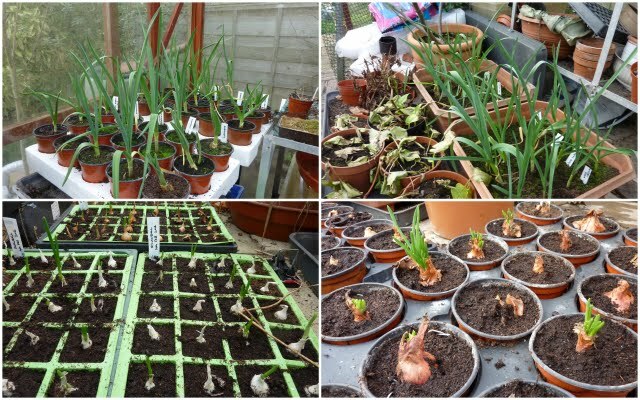 Onto vegetables - the garlic is still growing well and the shallot and onion sets that have been started off in small pots and cells are beginning to sprout. This method worked well for us last year. 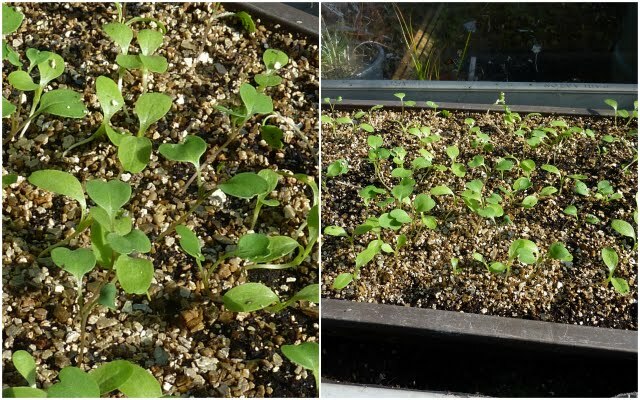 Instead of growing salad leaves under the indoor growing light which will soon be used just for seed germination and the raising of seedlings we now have some leaves growing in the greenhouse. These should take over once we have harvested all the indoor salad leaves. Our first set of broad beans - Witkiem Manita - have been sown in pots - again a tried and tested method. 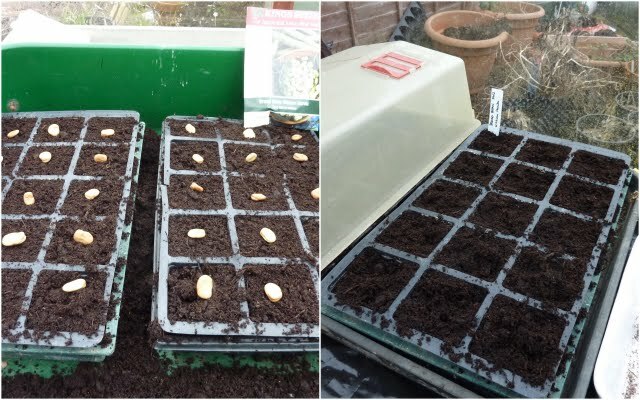 As we do have a bit of a field mouse problem the pots are being protected under a propagator cover which will hopefully keep the greedy creatures from digging up and eating the seeds. They are pretty resourceful creatures though so fingers crossed. The seed potatoes are also quietly doing their thing and chitting nicely under their fleece covering. I know not technically the greenhouse but I'll mention here that we sowed celery and celeriac last month. We haven't ever had any success with attempts to grow either of these vegetables so we are trying to stick by the rules this time and sow the seeds early. Something we rarely do as our seed sowing tends to be held off until March at the earliest. 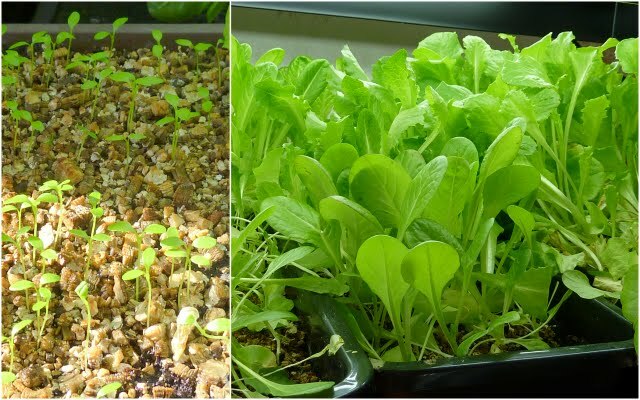 The germinated seedlings are sharing the growing light with the last lot of our indoor salad leaves. Don't forget to enter the competition here - I have had some entry forms submitted but it may be that some of you can't get the form to submit (it may depend on the browser being used) so you can email me your answers if you have a problem. My email address is on the side panel. I just thought I'd post a couple of photos of the parts of the garden that are the most colourful at the moment. Below is the front garden bed. 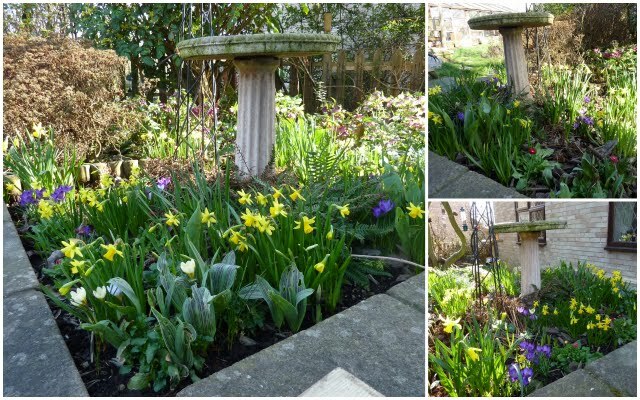 The crocuses won't last much longer but the miniature daffodils and mini irises are taking over centre stage. A couple of varieties of daffodils are fully open but there are another three varieties still with tight buds. 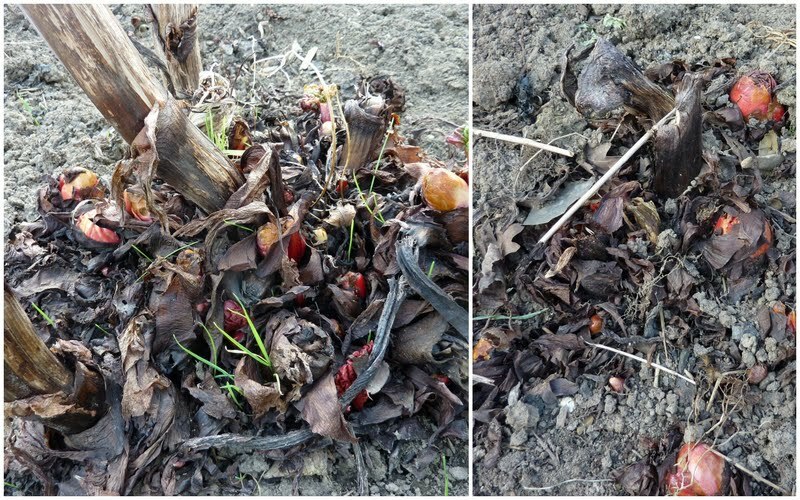 The species tulips started as red buds nestling at ground level in the centre of the cup of leaves but as the stem is lengthening the flowers are opening. The second photograph is what I call the bird bath bed. It's a bit confusing now we have another bird bath - well three now in fact but one is by the pond so not in a flower bed. If you look at the second photo on an earlier post here, the bird bath bed is on top of the higher bit of walling on the far left of the photo and so is also close to a house window. The idea is to have lots of early spring colour close to the house. In this bed the crocuses are later - the Cream Beauty crocuses in one front corner of the bed are coming up amongst species tulip leaves so are easily mistaken for tulips. I think the delayed crocus flowering is because this bed doesn't get as much sunshine. The main daffodil display is provided by Tete a Tete minis and you may just be able to make out some red bellis perennis (daisies) in the foreground of the photo on the top right. I'd have expected the daisies to be perennials with a name like that but apparently they're biennials so I'll have to sow more seed for next year! I am now no longer in a quandary about which perennials to buy for the border under the crab apple. Decisions have been made and things have moved on a pace. My list of plants was whittled down to fourteen which should nicely fill up the border alongside the plants that I bought last year. 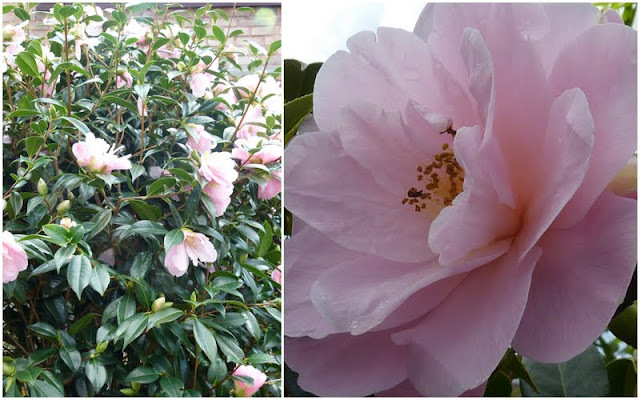 The list of the plants that I chose is here along with small images of the expected flowers and flowering times, so if you are interested you can take a peep. The athyrium filix-femina is intended to be planted in the trunk of the now defunct tree fern of which there will be more at a later date. As last year I ordered my plants from Beth Chatto Gardens as I was so impressed by the quality of the plants they sent me and the service that I received from them. Not only that but their prices are extremely reasonable all my plants were either £3.95 or £4.95. I emailed my order last Thursday around teatime along with a request that I should one of the out of stock plants come in later could I add it to my list. When we got back from the plot yesterday there was a message on the answer phone to say that they had managed to add the out of stock plant to my order and the order was complete and being sent out. The caller went on to say the plants should be with me Friday. Sure enough Friday morning they arrived. Overnight from Essex to West Yorkshire was what I call a good delivery service. Each plant was wrapped in wet newspaper and placed in a plastic bag which was then wrapped in dry newspaper. A couple were planted in pots. The plants aren't newly propagated so aren't babies - they look as though a large plant has been split into sections - just as you would if you were splitting your own garden plants. As last year we decided to put the plants into large pots rather than plant them straight out in the garden. 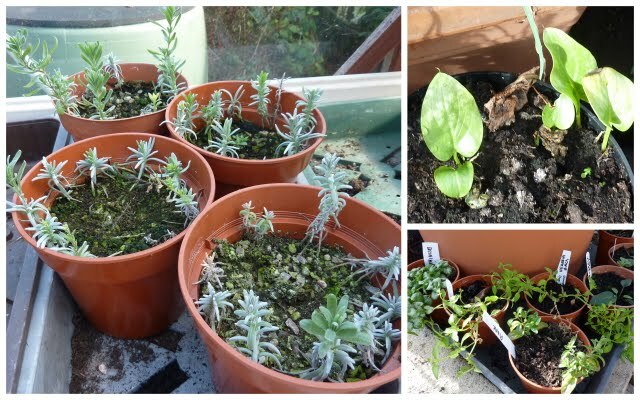 They seemed to respond well to a little TLC last year and it will also give me a bit more time to sort which of the plants already planted will need moving around to accommodate the newcomers. The plants are now sitting on the floor of our greenhouse settling in. The two in smaller pots were already potted when they arrived so I may move them on to larger pots soon. I'm looking forward to seeing how well they perform. As I passed the garden pond yesterday I heard the unmistakeable sound of frisky frogs. The throaty croaking sound was being produced by a large male frog who was holding on tightly to his chosen mate. Hopefully for him it was a female as amorous male frogs will grasp on to any moving object including other male frogs. The fish were curious and kept swimming up for a closer look at what was going on. A wise fish wouldn't risk being at such close quarters to a male frog whose hormones were tingling. In the absence of a suitable female an amorous male frog will latch on to a fish which can cause a problem especially if he covers the fishes gill slits. Once attached he is almost impossible to shake off so can drown the fish. I'm not sure whether the onlooker is another male or female frog but they obviously don't know that three is a crowd. I'm guessing the gooseberry is a female as a male would as likely or not pile on top in an attempt to dislodge the competition. This time at least those not involved had the decency to look away! Whilst I was busy with the stills camera Martyn filmed all the action and has posted on his blog here. I must warn you though his video isn't suitable for anyone with a nervous disposition as it doesn't just show ladybirds. Isn't it amazing what a little sunshine can set in motion.